Waiting in line for WWE Axxess. WWE Network playing on projectors. Going to your first WrestleMania event is an overwhelming experience. That's because it's not just one event, but rather a week-long convention for wrestling fans all over the world. In my various moments waiting in line, I'm come in contact with more nationalities than I have in my life, combined. It's truly a wrestling fan's dream. And even though these week's festivities center around the WWE, it's even parts non-WWE. There's really something here for everyone, which is a double-edged sword. This makes choosing between events really difficult. It's best to plan your moves for WrestleMania week as much as you can. But even still, you won't be prepared for what lies ahead. I found this out the hard way today, my first day in San Jose. 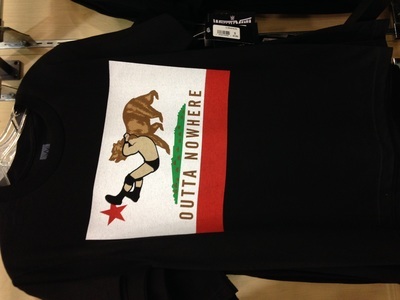 Now, I'm from Northern California, so I have that in my favor, but I'm not from the Bay Area, so it's still as new to me as it is to most people. I come from a very small town north of here, and I also have issues at times with anxiety. Not the greatest mix going into an arena of excited and boisterous wrestling fans. However, I found after my first day that my anxiety was the least of my worries. Here's how my first day of WrestleMania weekend went down. Boy, was it a doozy. We drove into San Jose at around noon in our rental car. You see, back on St. Patrick's Day, a truck plowed into the side of our car. Thankfully, everyone was ok, but our car was totaled. That's something we have to deal with when we get back from this trip. But anyway, we settled into our hotel and decided to go grab some lunch before we headed over to WrestleMania Axxess, where we would spend the rest of our day. We headed over to a place called NYPD - New York Pizza and Dogs. We got a medium pepperoni pizza (which was made to order) and three drinks for about $23. Not bad at all. If you're looking to save a bit of money and you're in San Jose this weekend, check them out. It was at NYPD that it really started to sink in that San Jose would be taken over by wrestling fans this week. Shortly after we got our food, wrestling fans started to pour in, including one guy wearing a CZW hat, which is just something you don't see here in California. After lunch, my wife, my son, and I headed out of the restaurant. The light rail was just down the street, and we were going to ride that down to the San Jose Convention Center for Axxess. As we were walking down the one block we had to walk before reaching the light rail, someone comes jogging around the corner, and it was none-other than Ring of Honor and PWG star Roderick Strong! I couldn't believe my eyes at first. I'm really not sure if you've ever experienced this, but when you see someone you've seen on TV or the internet hundreds of times, you do a double take in your mind. Is that really who I think it is? As he got closer, I was sure it was indeed Roddy. I waved to him and he took his headphones off, shook my hand, took a picture with me, and that would have been plenty for me. However, Roderick was extremely nice and said hello to my son and shook my wife's hand and introduced himself. I didn't want to take up too much of his time, so I told him I couldn't wait to see him in action tomorrow night at SuperCard of Honor and we parted ways. We headed over to the light rail and we were on our way to Axxess. The light rail was actually a bit nicer of an experience than I thought it was going to be. I've taken public transportation more than a few times, and have never been fond of it, but (at least in the day time) it was ok. It's $2 per ride on the rail, which isn't bad at all. We saw a few more wrestling fans on the light rail, and it took us about 15 minutes or so to get to our destination. 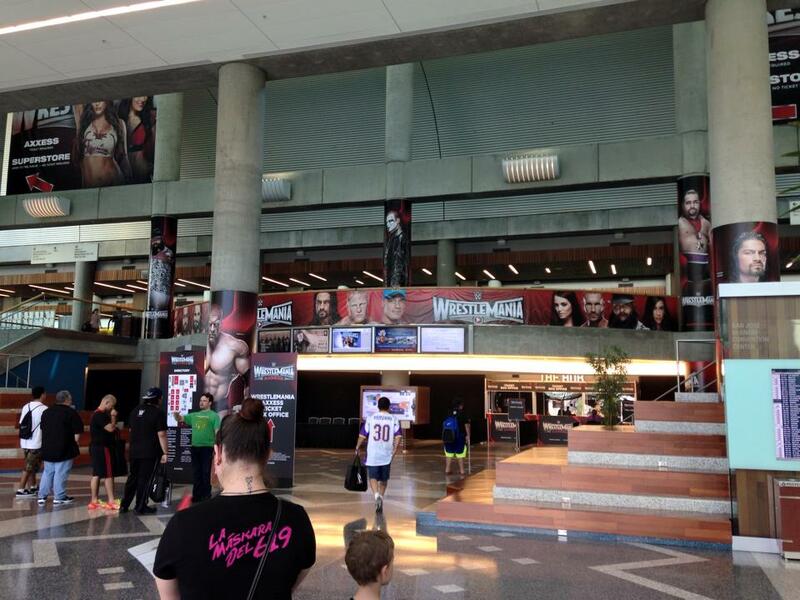 When we arrived, we noticed that the rail we were on was actually plastered with a WrestleMania ad, which was cool to see... but then we saw the Convention Center. It was grand. The Center is a pretty cool building as it is, but adorned with the WrestleMania ads, it was grand. Wasn't long before we found something you could purchase, as WWE had a truck set up outside, selling shirts and other merchandise. As we passed the truck, we were bombarded with program sellers. That was the first time I was hit with the realization that this weekend wasn't going to be cheap. The program, which we bought, was $25. TWENTY FIVE DOLLARS! FOR A PROGRAM! However, the program is actually one of the finest programs I've ever seen. IT'S HUGE! It's also pretty high quality. It has all the wrestlers you'd probably see at Axxess with a space for their signature, which was pretty cool. Although, for a completionist like myself, it drives me a bit nuts knowing I won't get most of the signatures. Once we got into the Convention Center, that's when I started to enter my comfort zone. No longer was I a tourist here for a wrestling event, but rather I was in my element. Inside the San Jose Convention Center, just outside the Axxess floor. Unfortunately, it wasn't long... well, actually, it was very long... until I made my first big mistake. I saw a line. I got in that line. I didn't know what it was for. I knew that you could just walk into the SuperStore if you wanted, but I figured this was the line for Axxess. Boy, was I WRONG. I found out after about 15 minutes in line that it was for a signing with Big Show. Now, I'm not a Big Show fan, but I figured I had about 2 hours until Axxess, so I might as well continue to wait. I wish future-me came and slapped me out of that line. I waited close to 2 hours in that line, only to get to the end and find out that you had to have a special bracelet. I left, hanging my head. Literally... I had to duck under the ropes to get out of line. I was pissed, but not as pissed as my wife. I rallied my family to shake it off and we continued on to the REAL Axxess line. There, WWE had set up three projection TV's with the WWE Network, so there was at least something on to pass the time. They played the Brock/Reigns promo a few times, and the crowd, which consisted of a few thousand people, was very anti-Reigns, very pro-Lesnar. It was funny. 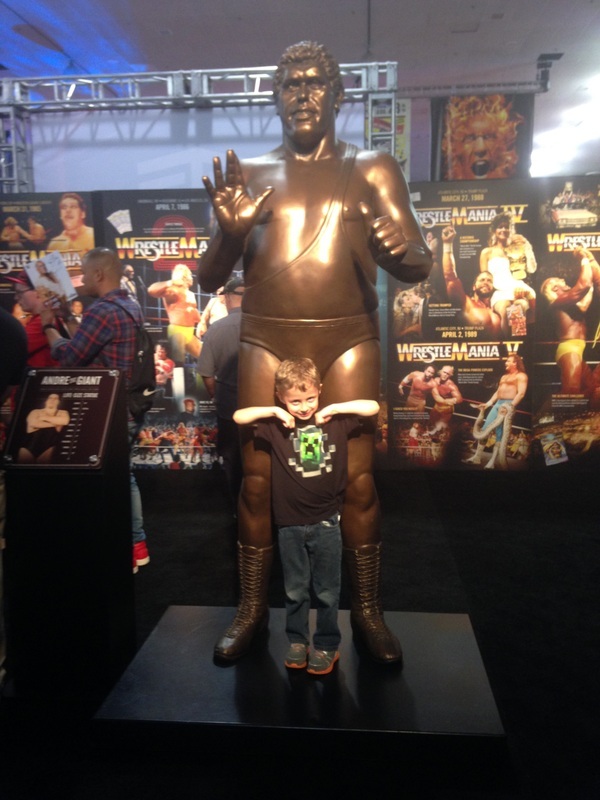 We waited a bit longer before they finally opened the Axxess doors, and good thing, too. My wife and son were both ready to leave without even getting into Axxess. It wasn't a good start. Before I go on to Axxess, I have to talk about what was one of my favorite things of Thursday: The SuperStore. It was awesome. I wish I had a brick-and-mortar SuperStore near me. There were so many cool shirts, toys, chotchkies... whatever you could think of. The prices were not great. Everything was a bit more expensive than it normally would be, but just to have the items right there in front of you to check out in person was worth the price hike. 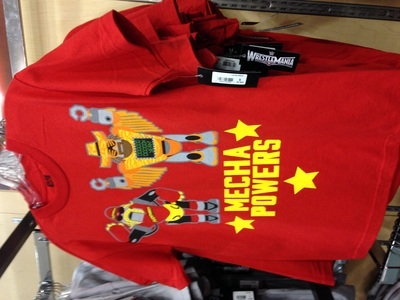 There were a ton of WrestleMania exclusive clothing items there. Things like Baseball, Soccer, and Football jerseys lined the walls. It was an excellent site to take in. I could have probably spent so much money there, but thankfully, I had good restraint. I wanted a Kevin Owens shirt, but unfortunately, they were out of XL sizes. Luckily, I was able to snag one inside of Axxess by the NXT booth. 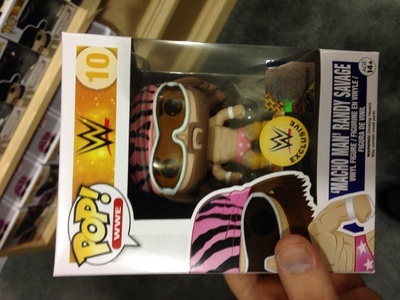 That was definitely a hot ticket at Axxess. When I walked onto the Axxess floor, that's when I fully felt like I was in my comfort zone. The floor was so big, that I never felt like I was overcrowded, but there was enough of that WWE touch to make Axxess feel like it was a big deal. My family and I went straight back to the NXT area, where they had the NXT ring set up. Unfortunately, there was no word on when the wrestling would begin, so I went off to the side where they had their NXT signing booth set up. 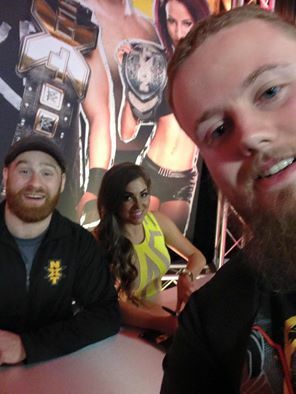 Sami Zayn and Devin Taylor were signing and the line was short, so I saw that as a prime opportunity to get in line. Sami was nice, but he was very concerned with moving the line along. He still took the time to pose for a picture with me. Devin was nice, as well, but I didn't talk to her much. After that, I grabbed something to eat at the Axxess snack bar. Food definitely didn't match the price, but that was probably to be expected. 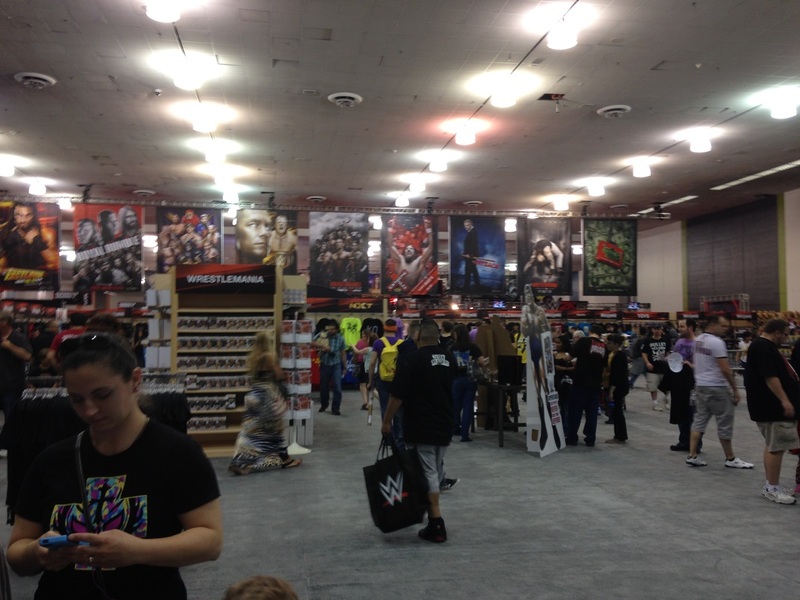 After we were done eating, we walked around the Axxess floor and checked out all the different things they had set up. Most of it consisted of signing booths, but there were a few things to physically do, such as the 2K booth where you could play WWE 2K15. They had also set up the Elimination Chamber, where you could pose with WWE Superstars inside the contraption. That's something I had wanted to do, but by the time I was done with my NXT experience, they had locked the Chamber down for the evening. The NXT was by far the best part of Axxess. The live wrestling, the shorter lines, the friendly talent... it was just what the whole experience should be. Humble and inviting to the fans who pay $45 or more for a ticket to experience your environment. Axxess could be better, but I didn't feel ripped off by the end of the night. I enjoyed myself, even with the tedious waits and horrible direction. Kevin Owens was an extremely nice dude and took the time to stand up from his seat and pose with anyone who wanted a picture. Black and Murphy were also great and never hurried anyone along.